The road still rises. But the climb is steeper, and the falls are more frequent. That's the view of prospects for upward mobility in the modern American economy that emerges from the latest Allstate/National Journal Heartland Monitor Poll. Although an overwhelming majority of Americans still define the U.S. as "the land of opportunity," nearly as many agree that getting ahead is more difficult for workers today than it was for previous generations. Only about one in five Americans say they have been able to get ahead consistently in their lives; many more say they have moved forward somewhat but faced intermittent reversals. And while a plurality of adults believe they have more opportunity to advance than their parents did, Americans are much more uncertain that the next generation will have greater opportunities than their own — with whites far more pessimistic than minorities. The new poll, the 14th in the series, explores American attitudes toward the possibilities of, and barriers to, upward mobility. Social scientists have long noted that Americans are more likely than Europeans to "believe that where individuals end up in the economic game — who wins and who loses — is the result of hard work and ingenuity" rather than family connections or circumstances at birth, as Isabel Sawhill, codirector of the Center on Children and Families at the Brookings Institution, wrote recently. The new Heartland Monitor Poll demonstrates both how deeply Americans believe the country offers opportunity to all those who will work hard for it — and the cracks that are emerging in that foundation after four years of economic turbulence unmatched since the Great Depression. On the most basic question, a resounding 86 percent of those polled agreed that "America is "˜the land of opportunity.' " Three-fifths say they are living the American Dream, defined "as the opportunity to go as far as your talents and hard work will take you and to live better than your parents. " (Despite years of disappointing growth, that figure is unchanged since July 2009.) Three-fourths of those polled say they also expect to eventually earn enough to become "financially comfortable and secure. " More narrowly, 53 percent agreed that "anyone who works hard still has a fair chance to succeed and live a comfortable life in today's America," while 43 percent took the contrasting view that "today's economy mostly rewards the rich, and it's difficult for average people to get ahead. " That's also unchanged since July 2009. Most Americans, as in earlier generations, still see themselves as captains of their fate. Asked what plays the greatest role in determining whether they will succeed, about two-thirds picked either their own skills and hard work or their educational background; less than one in five said the key factor was the economy's overall state. Only about one in 20 pinned the most responsibility on either government policies or their ethnic and racial background. If St. Aubin exemplifies the up-by-your-bootstraps convictions that lace through American history, other responses show doubts about whether those longtime rules still apply. 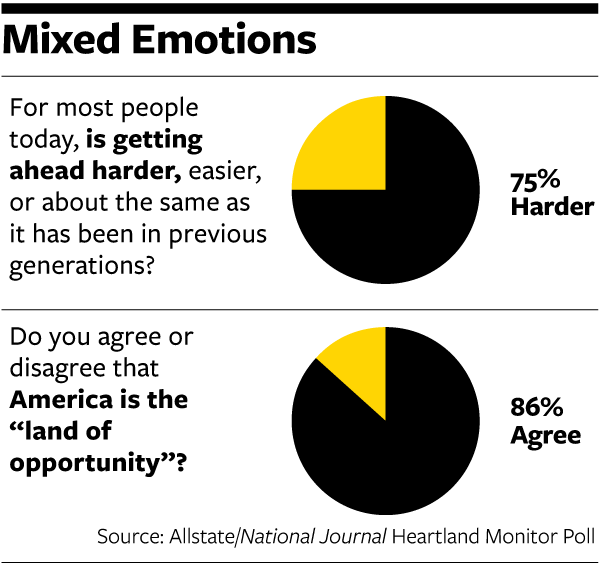 Like two earlier Heartland Monitor surveys, this poll records an equivocal verdict when Americans are asked to compare their opportunities to earlier generations: 48 percent say they have more opportunities than their parents did at the same age, but a greater number combined say they either have the same opportunities (28 percent) or fewer (23 percent). Whites (at 44 percent) are considerably less likely than minorities (at 61 percent) to say they have more opportunities than their parents did. And a preponderant three-fourths of respondents say they believe that for most people today, getting ahead is harder than it was for earlier generations; that verdict transcended racial, educational, and income lines. Large clouds also creep into questions about the opportunities available to the next generation. A solid three-fifths of those polled (and, again, slightly more minorities than whites) say that children from all races today "have adequate opportunities to be successful. " But respondents are much more closely divided on the question of whether children from all income groups have adequate opportunities for success: 49 percent say yes, and 48 percent say no. (Once again, whites are less likely than minorities to say yes.) Kristy, a respondent from Lynchburg, Va., who refused to give her last name, says that when she returned to college as an older student, she could see the enormous strains on young people with limited resources trying to balance work and studies. "The economy I don't think allows for anyone who isn't from the high middle-class to succeed easily," she says. The most fundamental question about the next generation evokes the most unease. Asked if today's children will have more opportunities than older Americans, only 32 percent said yes. In the four times the Heartland Monitor has tested that question since 2009, no more than one-third of Americans have ever said they expect the next generation to enjoy greater opportunities. In the new poll, an equal 32 percent said they believed today's children will have less opportunity to get ahead, while the remaining 31 percent said their opportunities would be unchanged. As in earlier surveys, whites remain far more pessimistic than minorities: Just 25 percent of whites believe the next generation will have more opportunity than our own, while 38 percent expect their opportunities to diminish. (College-educated whites are as pessimistic as noncollege whites, who have borne larger job and income losses in recent decades.) By contrast, 51 percent of minorities believe today's children will have more opportunity than they did, while only 20 percent believe they will have less. Those anxious responses partly reflect an ambivalence, especially among blue-collar whites, about the economic value of a college education. Although studies show that workers with college degrees earn significantly more money over their lifetimes than those without one, just 38 percent of those polled said they viewed a college education as a "ticket to the middle class," while 54 percent said it was "an economic burden that is often too expensive and requires taking on debt to pay for. " Three-fifths of both whites with college degrees and minorities (with and without degrees) saw such education as a source of advancement, but whites without a college degree split in half on whether the benefits of college justified the cost. Yet even Blackman worries about the mounting debt that college students now take on. That was a common lament in the survey. On a separate question, a resounding 70 percent identified the cost of obtaining undergraduate and graduate degrees as a major obstacle to getting ahead. And when asked what sort of experience best equips people to advance, just 41 percent picked a four-year college or university; another 27 percent preferred education and training at a technical or vocational school, while 24 percent said that on-the-job training was most useful. Once again, minorities and college-educated whites were much more likely than blue-collar whites to prioritize a four-year degree. Josh Coe, a white electrician from Dallas, is one of the college skeptics. "Everyone says "¦ go to college," he says. "Honestly, it seems like it's more of a headache because you've got bills straight out, and if you can't find a job in that field, you've got to take some other job. " The pervasive suspicion in working-class white America that college doesn't justify the costs threatens to reinforce the existing divergence in which children whose parents are college graduates are now five times as likely to graduate as children of parents without degrees. That dynamic itself, as a self-fulfilling prophecy, could stunt upward mobility and widen inequality, because studies show that children from parents in the lower-income brackets are far more likely to rise if they receive a degree than if they do not. As it turns out, Americans are expecting more inequality in the coming years. Nearly half of those polled believe the gap in income between the middle class and the wealthy will widen; another third predict it will remain stable. Only about one in eight expect it to narrow. Those results are remarkably stable across racial and educational lines. Americans also largely agree across those same lines, the survey found, on the markers that signify getting ahead. Some two-thirds of those polled identified as signs of such success owning your own home; having time outside of work to spend with families and friends; obtaining regular pay increases; becoming wealthy enough to retire early; and having a secure job "that you can rely on, even through tough economic times. " (Smaller numbers picked obtaining a college degree, achieving personal fulfillment through new experiences, or owning a business.) Strikingly, though, the most frequently cited indications of getting ahead (at 80 percent of respondents) were both the ability to save for retirement and living free of debt. The obstacles to advancement that most worry Americans in that question don't consistently align with either party's agenda. Instead, the public skittered between traditional priorities of the Right (taxes and regulation) and the Left (inequality, rising cost of higher education) and ultimately raised the greatest alarm about long-term global investment patterns of American companies that neither party believes it can influence much more than marginally. While the parties duel over the role of government (in a calcified argument that, the survey shows, has left neither with a national majority for its position), more Americans appear uncertain that either side can meaningfully address the employment and income challenges they face. That doubt may help explain why neither party has established any lasting advantage over the other in recent years. It also frames the picture emerging from this poll of a wary but resilient public that is systematically adjusting itself, more by necessity than choice, to an economic order in which nothing is more predictable than uncertainty. But in their own lives, and in their expectations for the country, most Americans are bracing for more trouble. Looking back at their own experiences, only about one in five say they have "been able to get ahead consistently. " Many more (55 percent) say they have been "able to get ahead somewhat, [but] with ups and downs. " And most people are not expecting much to change: Only one-fourth say they expect to get ahead consistently over the next five or 10 years, while the remainder anticipate rising with ups and downs (about two-fifths); remaining stuck in place (about one-fifth); or declining (about one in 10). Blue-collar whites are more likely than either college-educated whites or minorities to say they expect to remain stuck or slip back. "It's just getting harder and harder to make what I think I should be earning," Coe says. Amid these profound concerns, more-immediate assessments of the economy's trajectory show little change from the most recent Heartland Monitor Poll conducted in May. Compared to then, the share of Americans who say that the country is on the right track has ticked up only slightly, while the percentage who believe that their personal financial situation will improve over the next year remains virtually unchanged, and the number who believe that the overall economy will brighten has actually declined slightly. Even so, the survey shows President Obama opening a solid 50 percent to 43 percent advantage over Republican nominee Mitt Romney among likely voters, in part because significantly more voters believe Obama will advance policies that benefit all Americans. What's clear in the poll, though, is that many Americans feel the economy is experiencing fundamental changes beyond the reach of any president to reshape quickly, or perhaps at all. Although some respondents said they believed that the 2012 election would determine the level of opportunity available for future generations, many others said that the nation's economic trials reflect problems that have accumulated over time and are unlikely to be resolved soon. When asked to identify the barriers to getting ahead, more respondents picked the decisions by American companies to relocate jobs overseas than any other option. The Allstate/National Journal Heartland Monitor polls explore the ways that Americans are navigating the changing economy. The latest poll, conducted by Ed Reilly and Jeremy Ruch from the Strategic Communications practice of FTI Consulting, surveyed 1,000 adults for the entire questionnaire by landline telephone and cell phone from Sept. 15 to 19. It has a margin of error of plus or minus 3.1 percentage points. In addition, the poll surveyed another 250 adults to generate a sample of 1,055 likely voters for politically oriented questions; the margin of error for that sample is 3 percentage points.